This pilaster shelf clip is used for shelf support in many popular units from brands such as True, Beverage Air, Traulsen, and Avantco. These clips are useful for any kitchen with continental refrigerators. I've found ours to constantly rust or bend over time. Having a spare jar with 10 is great. No more slanted shelves. Simply replace as soon as you see one breaking. Definitely a little bit frustrating that these break in the first place but at least replacing is easy. Who doesn't need a stash of these clips hanging around in your office drawer. If you have cooks working for you, they will certainly find away to lose these clips. These fridge and freezer shelf support clips are fantastic. They work so wonderfully. Our fridges and freezers are packed and wouldn’t be able to survive without them. These refrigerator clips are amazing! They keep our shelves intact and stop all our products from falling all over the place. I would recommend these to anyone! These worked. But you have to be ready with some pliers. I had to squeeze them a little bit to make them fit my commercial fridge. Still, great price and solved my problem the day that I got them. Have used in multiple brands of fridges. great price that can't be beat on replacement clip for your prep cooler. very sturdy, hopefully I wont be needing to replace these again for a long time as long as employees dont lose them! We use these clips in our Turbo air amd Beverage air coolers. Good price and they just snap right in. Great replacements if you ever lose your originals. These Shelf Clips were the exact replacement that we were looking for. They work with out fridges and they are really secure. These shelf clips are an easy fix if you need extra shelves or if one of your shelves breaks. Purchased these to replace some clips that had developed rust and were no longer sanitary. These work well and look clean and shiny instead of rusty and dirty. These are much heavier duty than the thin metal ones that came with our freezer. They do a much better job at holding up the shelves than what we had. These do their job very well. We have not had many problems with any thing we have ordered from webstaurant and these meet our need! Every chef, restaurateur, cook, etc. knows how often these disappear on the line. They must go to the same place as socks and pencils. These are a perfect replacement that worked well with our True brand fridges. We have a few BeverageAir coolers and for some reason the clips they provide always fail or get rusty. We've since switched to these and they are tops! Much stronger and we've used for months and they look perfect still. The Refrigerator and Freezer Shelf Support Clip is an awesome item, it's exactly what I needed, and since we just a new replacement drill, I can get to business. You can never have too many of these laying around! Especially if you have any older style ones that start to rust. So far these have fit all of my different brands of refrigerators. These clips are outstanding. They are extremely sturdy and durable. There is never a problem with bending, cracking or breaking. They are super easy to install. I have personally been amazed that they are able to hold very heavy items without any issues whatsoever. Worked exactly as described. This shelf clip supports a large amount of weight and makes the shelves very stable. Easy to install on shelves and use. I ordered four of these shelf clips to keep as spares and to replace a couple of the clips in my cooler/freezer, that had begun to rust. these clips are good quality at a low cost. I will definitely order more when needed. These clips are one of those things you should have a bag of laying around but never do. I have tru and continental units and it fit both just fine. Nice clip that has a good amount of tension to it. Doesn't seem like it would bend very easily. Always keep a few of these around. Clips did the job very well - we had some rusted and bent clips that needed to be replaced. These fit well and I bought in volume to save cost/item and I keep the extras in a bag in the kitchen office. This shelf support clip is perfect for home and commerical use. Not only did it fit universally in multiple coolers, it also supports a great deal of weight. I was fortunate to come across an old commercial refrigerator, but it was rusted on the inside. I cleaned it up and replaced all the clips with these, and it looks brand new! This is much better pricing than most other places online. It is always a good idea to have these on hand. They are standard size and fit any cooler or freezer we have tried them in. They seem to disappear from time to time and we love these for when that happens. The fridge/freezer support clips are high quality for a low price, exactly what we needed. They hold a lot of items but don't buckle under the weight. Works as expected in my freezer. Clip is pretty stiff, so you will need a pair of pliers to get them in place, but they hold a lot of weight! Perfect to replace any refrigerator or freezer shelf clip. We have used these in both our cold prep table and our stand up fridge in the kitchen. 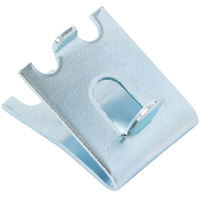 These Refrigerator and Freezer Shelf Support Clips are a great item on this site. We always are losing clips for our fridges or freezers, so to have easy and cheap access to this is great. We will never run out of shelf clips again! These are standard size and don't bend too easily, which means you can get them in the holes but they won't buckle. These are great, they hold up well and are an exact replacement to the clips in my true reach in double door cooler. They handle a lot of weight, and last a very long time, and are extremely cheap here. We bought these because we were catering a gig at a place that I noticed was missing clips when performing a site visit. I've decided to keep some on hand in my tool kit in case we run into missing clips again. Cheap and effective enough that other off-site caterers might want to do the same thing.